The global financial crisis of 2007 did put known business rules in capital markets into question. An example was the perception of derivative deals. Had derivatives until then been seen as a sufficient insurance against business risks, the structural failure of major institutions such as Lehman Bros. fostered the need for a more fundamental risk assessment (and protection) within the finance industry. XVA Analytics has emerged as the key response to this need. CVA (credit valuation adjustment) -> Difference between an entirely risk-free portfolio and and identical portfolio considering the default risk of the respective business partner. Essentially the value reduction of a deal from the perspective of business partner A caused by the default risk of business partner B.
DVA (debt valuation adjustment) -> Value reduction of a business deal caused by a party’s own default risk. The CVA of party A is the same as the DVA of party B and likewise. FVA (funding valuation adjustment) -> Value reduction of a deal due to liquidity risks. KVA (kapital valuation adjustment) -> Money amount that needs to be put aside due to regulatory rules as an “insurance” of market partners due to each party’s default risk. 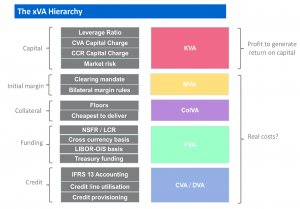 Equals CVA / DVA in amount (as CVA can be seen as the “market value” of the default risk. In a nutshell XVA Analytics determines a value to which a derivative deal needs to be additionally “insured” to avoid the risk of a complete financial loss due to the default risk of a business partner. We are applying blockchain technology for master- and reference data to enhance your in-house XVA adjustments for trading, counterparty risk management. Achieve regulatory compliance with us.. Thanks to superior master- and reference data reporting Advanced Blockchain Solutions’ XVA Analytics beats or enhances competitive offerings strongly with regards to operational efficiency. Whether seeking to meet regulatory requirements, hedging or actively trading your XVA positions, Advanced Blockchain Solutions’ XVA Analytics offering provides state of the art, complete, reporting for managing XVA. We identify impact on counterparty risk, collateral and profitability across the institution. Underpinned by the market tested cross-asset analytic open source library finmath.net, Advanced Blockchain Solutions XVA Analytics gives users the ability to calculate, analyze and limit exposures across business units and minimize capital charges for Basel III and SA-CCR compliance, and provides front office support with fast and accurate PFE, CVA/DVA, KVA, COLVA and FVA calculations, by using Adjoint Automatic Differentiation. We offer professional services to connect your in-house risk engine to our XVA blockchain or to extend your current pricing platform with finmath.net. While building portfolio data on distributed ledger technology and thus providing superior features such as security, transparency and stability, Advanced Blockchain Solutions’ XVA Analytics offers privacy for business critical data of participating institutions e.g. your own positions. Advanced Blockchain Solutions XVA Analytics lives on your platform connected to the XVA-Blockchain DLT data, to achieve a next generation margining, risk, analysis and trade management platform designed to build trust in capital markets. Applications like Advanced Blockchain Solutions XVA Analytics are the building blocks of your dynamic solution, allowing enterprises to customize the framework to meet complex business needs. Bond data and collateral not mandatory for Securitisation Reporting http://www.ecb.europa.eu/paym/coll/html/index.en.html help to bootstrap market data of the XVA Blockchain and can on top define your BCBS 239 sources. The blockchain consensus for market data is based on official ECB interest rates and exchange rates.